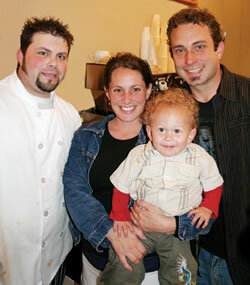 Pictured from Abbey Lane Cafe is Head Chef Brian Algee with owners, Jason and Jodi Gourson, along with son Max. Spanish Made Friendly hosted its grand opening and ribbon cutting at the Chamber offices on April 21. The company boasts several programs for adults, businesses and children that help English speakers with Spanish and Spanish speakers with English. Their main program, Spanish for Business, offers on-site language training for both English and Spanish. Call 254-4678 or checking out www.SpanishMadeFriendly.com or www.Lucasclub.com for more information. 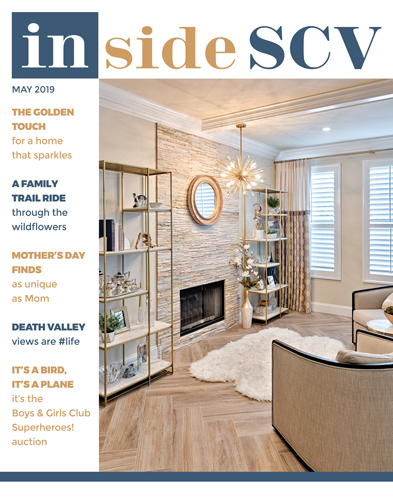 Local entrepreneurs have launched an at-home sales venture promoting a passion for fashion and financial freedom in Santa Clarita. Million Wishes is a new party plan that brings friends and trends together while encouraging the entrepreneurial spirit. Showcasing jewelry, handbags and belts of the season, your local Million Wishes style consultants, Janine Clinton and Stacey Titter, have launched their own businesses to educate women on the latest trends. Designed to sell an exclusive line of trend-setting jewelry, handbags and belts through in-home parties, Million Wishes was launched in March 2006 by Jones Apparel Group, the parent company of Jones New York, Nine West, Enzo Angiolini, Anne Klein and other well-known brands. For more information contact Janine Clinton at 313-0469 or visit www.janineclinton.mwishes.com. For Stacey Titter call 212-2275 or visit www.stacey.mwishes.com. Goddess Charity and Fun Night. On April 27, Balance Point Spa in Canyon Country hosted its second Goddess Charity and Fun Night. 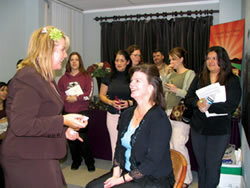 Guests of the free event were treated to a Loose Goose wine tasting, as well as food from Dream Dinners, a makeup demonstration from Sally Van Swearingen (shown above with Cynthia Kittle) and more. Guests brought gently-used clothing for Single Mothers Outreach and purchased mini-services like massages, foot treatments and intuitive readings. Half of those proceeds went to the Zonta Club of Santa Clarita. For more information on these events, call 252-0650. The Creative Years Nursery staff and students had a grand time at the Annual Faire & Silent Auction on April 29. The event featured carnival games galore, baked goods, face painting and even a choo choo train for the kids. On April 29, the staff of Inspirational Home & Garden hosted a Mother's Day celebration and book signing featuring Tracy Klehn of "Prayer Starters for Busy Moms." Musical entertainment was provided by Katee Gadette. Guests also enjoyed checking out vendors like Hands Cast in Stone. Known for first-class home accessories, particularly custom outdoor cushions, pillows and more, Esther & Frankie also offer fine pet loungers. This expansion of their business replicates the high quality found in their other creations, including machine-washable micro-suede, down-like polyester filling with pillow-ticking covers, replaceable inserts and more. For additional information call 288-0459. 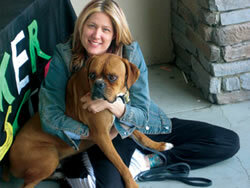 Stephanie Duke, owner of Starpups Depot, cuddles a rescue from the Boxer Rescue before he leaves for his new home. Starpups Depot is celebrating one year in business in June. On June 10 from 10 a.m. to 6 p.m. and June 11 from 11 a.m. to 5 p.m., Starpups Depot will celebrate their one-year anniversary with free goodies and a raffle drawing for a custom "pawtrait" by Robyn Feeley of Bungalow Art. Over the year, the doggie wonderland has offered puppy photo shoots with Lisa Ahrens of Camera Shy, offered "Meet the Trainer" day, helped animals from the Boxer Rescue and Labrador Retriever Rescue find homes, helped ASPCA's Hurricane Katrina relief effort, and more. Says Owner Stephanie Duke, "I want to thank all of my patrons for their dedication and loyalty. Your support has allowed me to keep pursuing my dream." The Valley Industrial Association of Santa Clarita is proud to present the B2B Regional Executive Summit on June 15 and 16. Held at Tournament Player's Club Valencia and the Hyatt Valencia, the event will span two days including a golf tournament, CEO Reception, peer-to-peer executive meetings, a key note speaker, and more. The Summit is intended to bring executives together from Kern, Ventura, and Los Angeles counties to cover topics that are universal to organizations throughout this region. VIA is also looking to encourage business relationships, solutions and partnerships across these county lines. CEO's are being targeted through partnerships with the LAEDC, VICA, EDC of Ventura County, Kern County Board of Trade, and Antelope Valley Board of Trade. Event Chairman Alan DiFatta of DiFatta Graphics states, "By encouraging participation from outside of our valley, we are bringing new contacts and new opportunities to our members. VIA's mission is to present business solutions to its membership and this event is in line with that objective. We've received great enthusiasm from partners in the outlying communities and are very excited about our first Summit." The Regional Executive Summit opens Thursday, June 15 with an executive golf tournament at Tournament Players Club Valencia, sponsored by Hedman & Associates CPA's. Following the tournament, Telesis Community Credit Union and Tejon Ranch are proud to sponsor the CEO Reception held on the patio of the TPC. Wine will be sponsored by The Loose Goose. Day two of the Summit begins with the Executive Exchange at the Hyatt Valencia. In this session, 50 key executives will meet one-on-one to share common business challenges and solutions. Executives will participate in this portion of the Summit by invitation only and will also attend the luncheon and afternoon activities. Following the Executive Exchange, the luncheon will begin with a brief economic forecast for the tri-county region. This presentation will lay the groundwork for breakout sessions later in the day. The forecast will be followed by an address from keynote speaker Sunne Wright McPeak, California's Secretary of Business, Transportation, and Housing. Tickets for the Summit include access to Thursday's CEO Reception and Friday's luncheon and afternoon sessions. To close the day, conference guests will reconvene for a panel discussion regarding the content of breakout sessions. Comments, ideas, and challenges brought up during the breakout sessions will be presented to a panel of economic development professionals representing the entire tri-county region. There are various opportunities for participation in VIA's B2B Regional Executive Summit. For more information visit www.VIA.org or call 294-8088. Providence Holy Cross Medical Center announced that a study of quality at the nation's 5,000 hospitals has named Providence Holy Cross Medical Center among the top 5 percent in the nation and a recipient of the 2006 Distinguished Hospital Award for Clinical Excellence. The study, conducted by HealthGrades, the leading health care ratings company, found that hospitals in the top 5 percent in the nation had mortality rates that were, on average, 27 percent lower than other hospitals, and major complication rates that were 14 percent lower. Providence Holy Cross has attained a national reputation for quality, including being named to the "America's Best Hospitals" list by US News and World Report magazine, "Employer of the Year" by the Oncology Nursing Certification Corporation, and "Best Hospital in the Valley 2005" by the San Fernando Valley Business Journal, among many others. On June 3, Wine 661 will support the goals of the SCV Wine Classic as it returns to CalArts. The region's premier wine-tasting event and fundraiser for the Santa Clarita Valley Youth Orchestra will feature an excellent array of rare and vintage wines donated by collectors and merchants. It is also an ideal event for food and music lovers as well, offering gourmet food from some of Santa Clarita's finest restaurants and catering services, and live orchestral music. For more information or to purchase tickets to the event, call 362-3415 or 362-5604 or visit the website at www.scvwineclassic.org. The Retired Police and Firefighter Association will hold its second annual Tommy Bahama charity fundraiser on June 10 at All Corked Up. The event will feature wine and food tasting opportunities, as well as a live and silent auction. RPHAF donates time and resources to various programs designed to empower parents who are working to raise the next generation of SCV residents. For tickets or more information call Sandy Rongstad at 310-2004. Presented by All Corked Up, the festival will be held at the Saugus Speedway. Fine wines, mouth-watering food, music and art will all be made available for guests' enjoyment. For sponsorship information, call 799-7979.